Streetsmarts Self Defence Tactics Be your own Body Guard, Protect your loved ones and get home safely with peace of mind Click on buttons below to find out about us, training methods and class times. The way we train we develop reflexes and responses and hence your muscle memory capabilities, so under stress or threat you can react to any given situation without conscious thought. This skill is enhance through specialised drills in the constant practice of realistic combat scenarios, a form of training used by the military, police organisations and professionals alike across the globe. Pressure drills is great way to test tactics and techniques and replicant real world situations and cirsumstances. Preparing one for actual violent encounters. 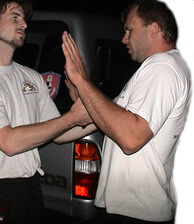 WHAT MAKES STREETSMARTS SELF DEFENCE TACTICS EFFECTIVE OVER OTHER SYSTEMS? The old saying “the more you train it the more you gain it.” Your training is based upon muscle memory retention that requires repetition to lock techniques into your sub conscious memory so you have the ability to perform under stress. The best example I always use of muscle memory retention is driving a car. We all know where the brake is from using it all the time (skill development). When you are about to have a car accident you automatically slam your foot on the brake through muscle memory retention. Combat training works in the same way. You practice for realistic situations and when they occur you react to them. I was going to europe at the airport stan give me a simple technique in 2 minutes. I used it 3 it escape a bad situation. Very effective tactics and Stan is not afraid to answer the what if they do this... questions, make its fun, with great depth of knowledge and monthly themes that help us work on different area, good fitness. 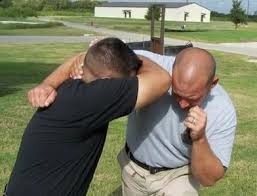 As a security officer I learnt all the moves I could use, but not how to apply them in a bad situation Streetsmarts Self Defence Tactics help make them practical. 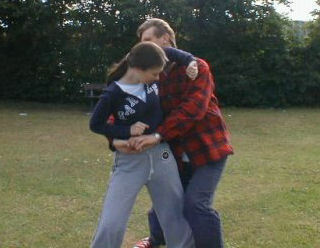 Learn to defend yourself in any situation, in any place, against any person, against any weapon. Combat tested, battle proven, street ready, no bull tactics to keep you and your love ones safe and alive in a violent world. A simple easy to learn system for men and women and even kids. Covers Standing sitting and and even flat on you back.